KEY FEATURES: A small tree to 5m. 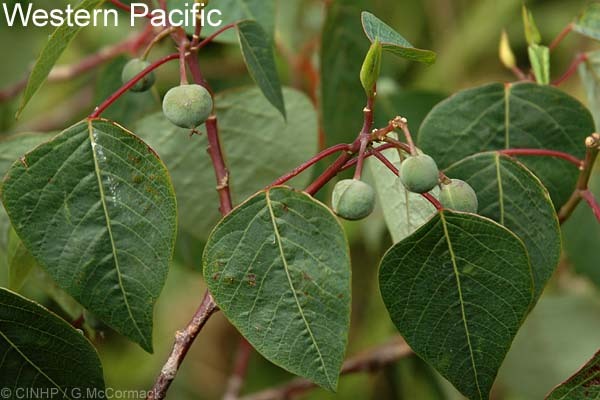 LEAVES terminal clusters, alternate, wide-oval to triangular, to 10x10cm, surface waxy, edge very wavy, veins conspicuous, topside green, underside pale green; stalk long, to 10cm. FLOWERS a spike to 10cm with 1-2 female flowers at base then many small male flowers. FRUIT pendant, oval, to 10x8mm, with 4 ridges, and conspicuous remnant style; often asymmetrical, ripens red. SEED ovoid, 6x2mm. 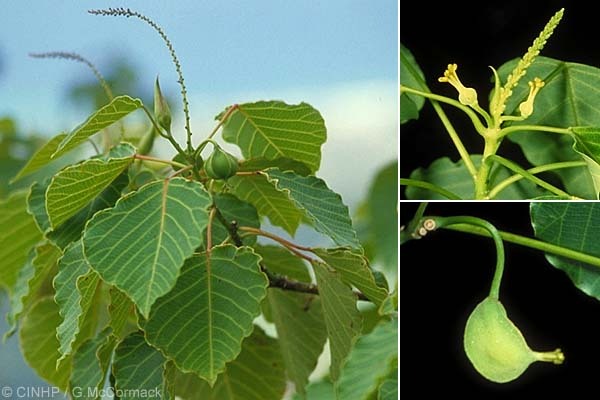 TAXONOMY: PLANTAE; ANTHOPHYTA (=Angiospermae); MAGNOLIOPSIDA (=Dicotyledones); ROSIDAE; Euphorbiales; EUPHORBIACEAE. COMMENT: Homalanthus versus Omalanthus has been a controversial subject. The early history is that A.H.L.Jussieu wrote Omalanthus in 1824 and in 1828 Reichenback corrected the spelling to Homalanthus, which is considered a better translation of the Greek for "equal" or "level". The International Code of Botanical Nomenclature based on Esser 1996 [Taxon 45:555-556] ruled that the spelling Homalanthus is conserved. Following the rules of conservation the spelling is credited to A.H.L.Jussieu 1824 and not to Reichenbach 1828. The names are as listed below. Homalanthus A.Juss. 1824 (orth.cons. = spelling conserved) synonym Omalanthus A.Juss. 1824 (orth.var. = spelling variant) synonym Homalanthus Reichb. 1828 In our region the spelling Omalanthus is found in: A.C.Smith (Flora Vitiensis Nova, v.2, 1981), J.Florence (Flore de la Polynésie française, v.1, 1997) and A.Whistler (Plants in Samoan Culture, 2000). BIODIVERSITY: Nationally endangered (seriously). Comment: Known from a few trees in the Cloud Forest of Rarotonga. GENERAL NOTE: This species was formerly included in Homalanthus nutans with a distribution of Vanuatu to French Polynesia. Sykes (pers.comm.) 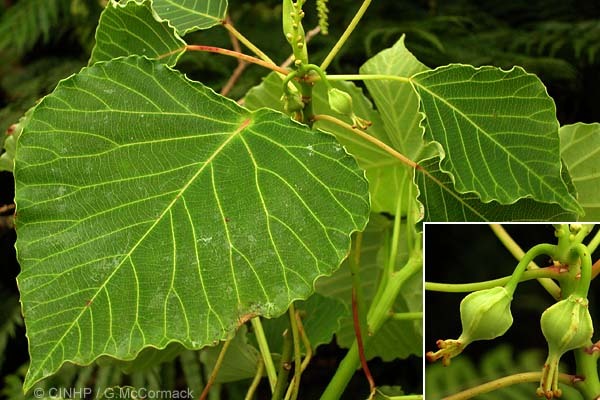 concludes that the plants in the west are different from those of Rarotonga, and our plants should be called Homalanthus moerenhoutianus, and endemic of the Cooks Islands and the Socities.